With just 7 weeks to go before B flies out from RAF Brize Norton (H is following in October), preparations for the move are well under way! 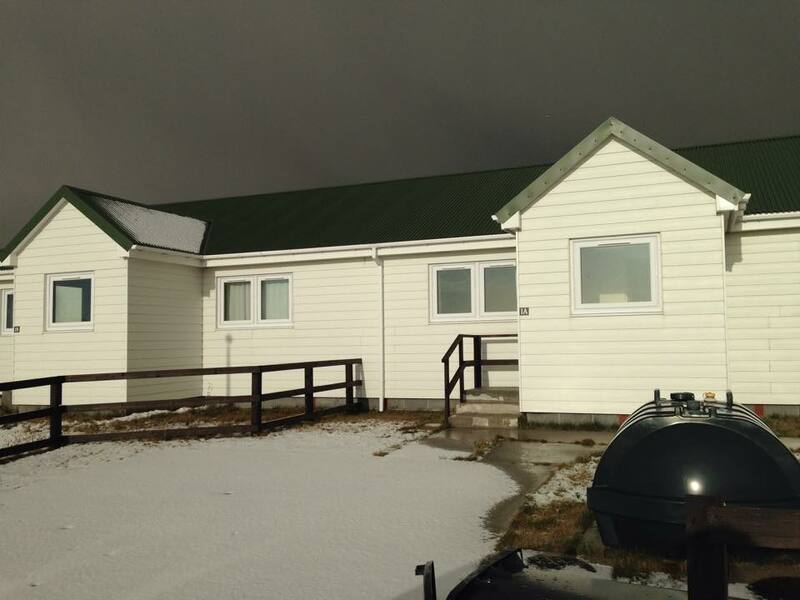 We’ve been lucky enough to hear from a number of people in the Falklands (all of whom have been out-of-their-way helpful!) and so we have a little more of an idea of what we are letting ourselves in for! We’ve read of people comparing Stanley to a Lego town and the multi-coloured roofs of the typical houses go some way to explaining that. We’ve been lucky enough to get a picture of our future residence sent to us (thanks Zoe!) and it seems we’re the dark green flavour of Lego. As you can see, the heatwave we’re enjoying up here isn’t exactly striking down there (obviously it’s mid-winter in the Southern hemisphere and the Falklands are about 5 degrees colder than the UK on average). At the moment, we have as many questions as everyone else so we’ll update you as we get closer to the time and the flight! As we’ve mentioned, please feel free to use this as a place to keep in touch with us as well as up-to-date – we’ll look forward to comments, messages and updates from you too!